SKF NOTE: Cozy Cole was a marvelous drummer. My introduction to his playing was through a CBS imported album I owned called something like, The New York Jazz Scene. It was a collection of late Swing, early BeBop recordings. Cab Calloway‘s Orchestra had two cuts on the album. Both featured drummer Cozy Cole: Ratamacue and Paradiddle. Both performances really impressed me, especially Ratamacue. I am sorry I missed, that any writer from Modern Drummer missed, interviewing Cozy Cole while he was still alive. 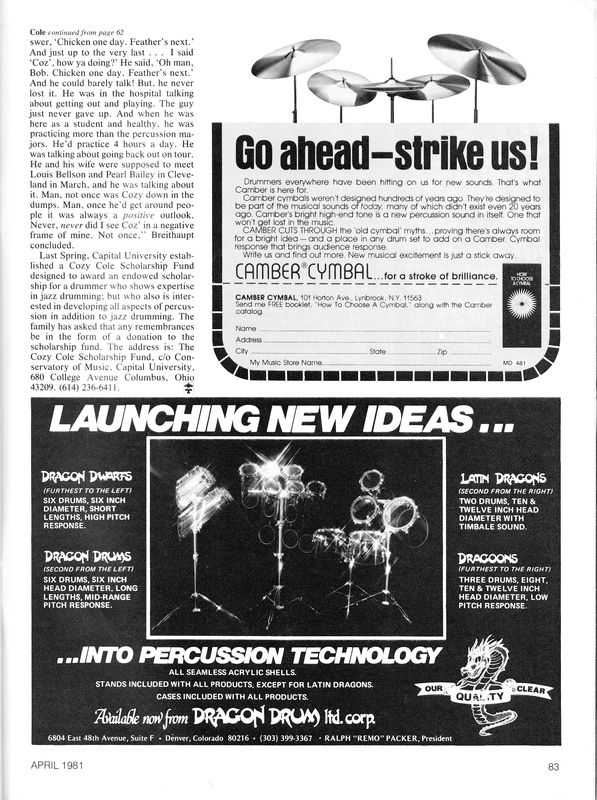 I think we must have been focused on interviewing drummers more popular at the time. All MD editors agreed Cozy was deserving of a feature interview, but when? And then Cozy Cole died. Remember: this was 1981. Long before the internet and blogs. MD‘s editors still had a magazine to publish every month. The contents of those issues demanded our attention first. And, as I’ve written before, MD was a commercial business. The goal was: sell magazines. That wasn’t the only goal. But if we didn’t sell magazines, MD would be out of business. We thought we would have time to interview Cozy Cole — and we were wrong. If I had it do all over again? I would have arranged a Cozy interview and worried later about when we would publish it. Anyway, I ended up being MD‘s unofficial obituary writer. This is what I wrote when Cozy Cole died. 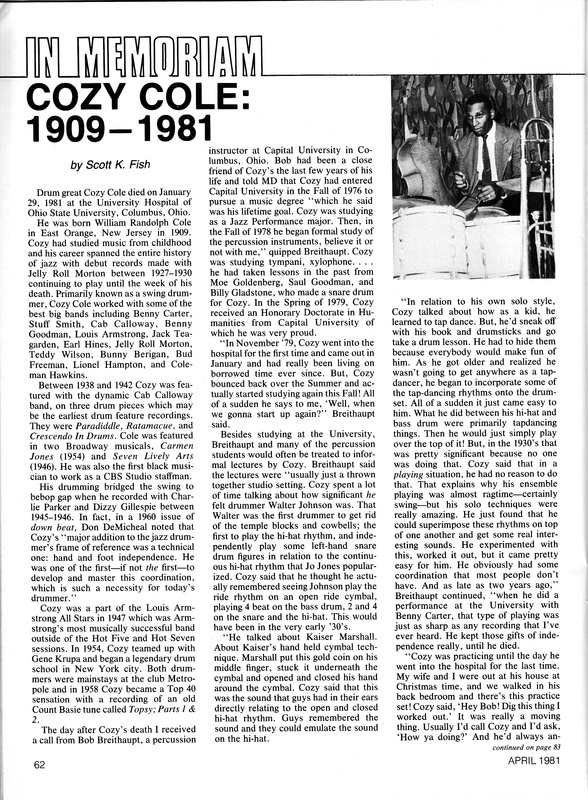 I would like to revisit Cozy Cole and put together a piece about his contributions to drumming and to jazz. A couple of weeks ago I sent an email to Bob Breithaupt – a percussion instructor who was friends with Cozy in 1981. I’ll let you know when I hear back from Bob. This entry was posted in SKF Blog and tagged Bob Breithaupt, Cozy Cole, Drummer, Modern Drummer, Obituary, Scott K Fish. Bookmark the permalink.